Name : Maadhavi Nemkar – Kulkarni. Date of birth : 17th May. 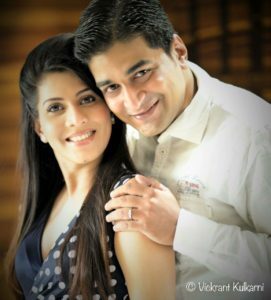 Husband / Spouse : Vikrant Kulkarni. Married since 2010. Maadhavi Nemkar is a beautiful and talented Marathi actress. She is a versatile actress and currently well known as Shalini for Zee Marathi’s show Hum Toh Tere Aashiq Hain. 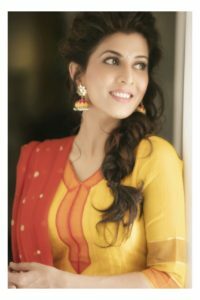 One day she went to the E TV’s office with her cousin Sonalee Khare and there Santosh Ayachit spotted her and asked her if she would like to host a show titled Gaane Tumche Aamche and she said yes. It was her debut project. After that she got a chance to work in a play titled Shahanyani Khave Basun. She started her acting career with plays. Her other plays include Surakshit Antar Theva (She has also received best supporting actress awards for this), Baykochya Nakalat, Pehchan Kaun, Get Well Soon. 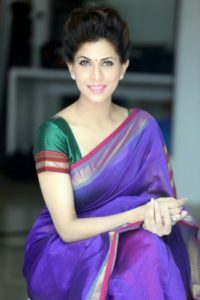 Her popular serials include Swapnanchya Palikadle, Agnishikha, Ya Gojirwanya Gharat, Jaawai Vikat Ghene Aahe, Kunku. Her other serials include Goshta Eka Collegechi, Unn Paaus, Anamika, etc. She also did few cameos, to name one it was recently in Zee Marathi’s popular show Majhya Navryachi Bayko. She has also worked in films which include Sangharsh, Sagla Karun Bhagle, Asa Me Tasa Me. Other than all these projects she has done many TVC’s like Hyundai and her recent TVC of Jupiter is with popular actor Amitabh Bachchan. Her career graph so far seems impressive. Maadhavi Nemkar is basically from Khopoli and currently resides in Mumbai. Her family includes her husband and son Reuben. Her husband is a Marketing professional in a private firm. She came from a lower middle class family, so for money she had to do job few months. Her parents and brother supported her morally. Maadhavi says her biggest support pillar is her husband Vikrant, even though it’s an arranged marriage he loves and understands her unconditionally. He started to work from home in order to help Maadhavi manage her career and their home. He also pampers her a lot with many gifts and supports her more than anything. Maadhavi says I’m blessed to have him as my life partner and he is the reason that I can achieve everything. Maadhavi Nemkar is very health conscious and she likes to stay fit. Her hobbies include singing and dancing. She has learnt both but due to busy schedules she can’t get enough time for practicing it daily.